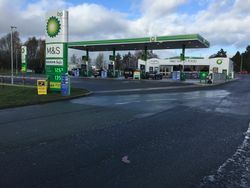 Two petrol stations near the Welsh border. The northern one is positioned at the Gledrid Roundabout making it accessible to both sides. 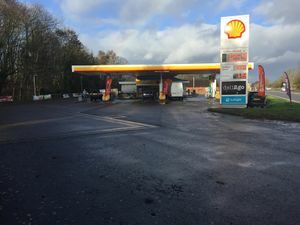 It has a large lorry parking area known as Chirk Truckstop. The newer Gledrid Roundabout services. The northbound side was home to the Weston Rhyn branch of Little Chef. It opened in 1990 and closed in 2005. The forecourt opened as the Moreton Bridge garage in the 1940s, and by the 1980s it had moved slightly to replace an ancient property. The newer roundabout site used to be an unsigned forecourt, but gained signage following a refurbishment of the site in 2017.